Way, way back, (when I first got my Lambretta for a second time) I knew that I wanted a classic waxed jacket. 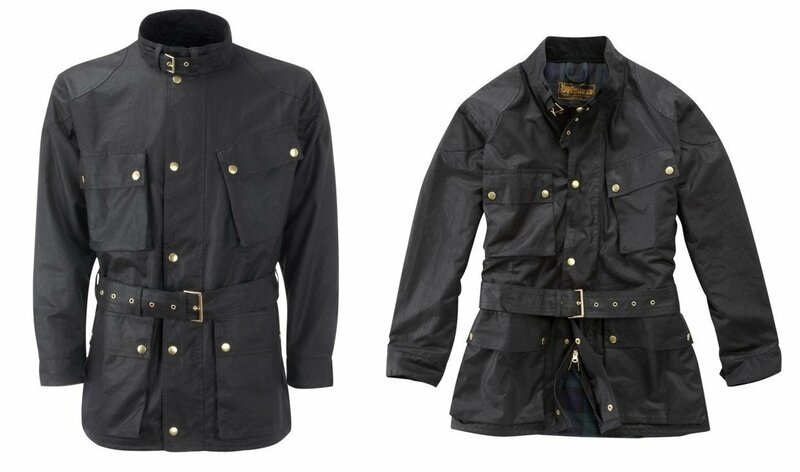 Something like a Barbour International, or a Belstaff Trialmaster. What I didn’t realise was how expensive these two classics had become. I settled for something in a similar style, from another brand (Jack Murphy), and it’s fine. Really. But it’s never been quite right. So I’ve kept an eye on eBay, hoping for a bargain in the Barbour / Belstaff stakes, and missed out on a few bargains. (Like a lovely vintage Trialmaster going for £60!). I’m still looking. But in the meantime, I’ve spotted a few alternatives that I think have nailed the look, and performance of these original classics. This is quite a long post, (the longest since my helmets one!) so stick with it! Manufacturer description: Made in heavy duty twelve ounce black wax cotton. This jacket draws its inspiration from the traditional wax jackets used in a bygone era. Using modern technology to improve the production and quality of a true classic we have produced a timeless piece of motorcycling history attire. We have used traditional techniques and Genuine wax cotton oil skin fabric to produce the “original technical garment.” Attention to detail is key in creating the finest garments available. Each one is conceived to transcend fads and remain classic, therefore having quality and durability. As time passes this garment should become even more unique and evolve with the wearer. The end result is one that is as natural and authentic as you. My thoughts: Looks the part, great price, and the review seem to bear out the quality of this jacket, one to bear in mind. 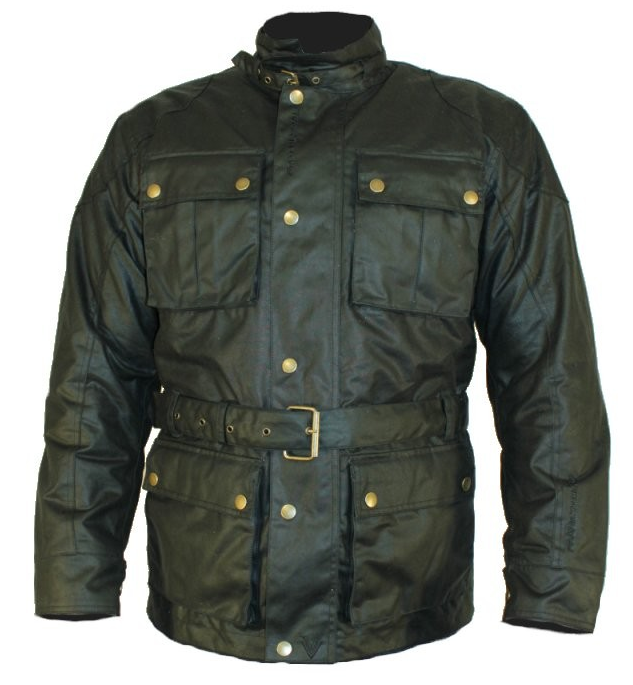 Manufacturer description: The Bikers Gears Answer to the £500 Belstaff Trailmaster – Made in age treated full grain leather (BROWN) Unique hand waxed and oiled finish that renders the garment water repellent – Detachable thermal quilted vest – Full sleeve mesh. Fastened by a buckled throat latch collar – Tightened at the waist by a leather belt passing through five leather belt rings. Closed on the front by a zip and flap with hidden press buttons YKK brass zipper on front and Zips at the cuffs. 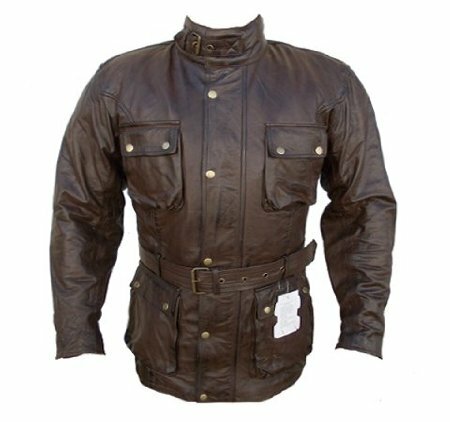 Jacket has removable soft protectors on shoulders and elbows which meet the requirements of European CE Technical Standard EN 1621-1:1997. Back protector = soft foam also. This jacket has 2 lower, 2 upper patch pockets which are closed by flap and snap buttons. – Jacket have internal pocket.”THIS WILL BE THE BEST £97 YOU EVER SPENT”. My thoughts: Although not a waxed jacket as the others are, this one seemed too good to not include. The styling details look spot on, and, as with a good wax jacket, this will only look better the older and more worn in it gets. There are some scooterists who wouldn’t want to wear leather… but I’m not one of them. I already own one “Aussie Gear” jacket, a high viz, armoured one, which I am very happy with, see my review of that here. I think these guys sell great products at value for money prices, don’t be put off because they seem “too cheap”, they sell quality gear. Manufacturer description: The Frank Thomas FTW358 Pitman Wax Motorcycle Jacket features a retro classic styling, CE approved amour at the shoulders and elbows, soft foam back padding (upgradeable) fashionable buckle fastening at collar and waist, removable thermal body liner, chest, waist and hand warmer pockets, adjustability at cuffs and is available in 2 colours. My thoughts: Frank Thomas is a well known, well regarded name in motorcycling gear, with a reputation for quality. If anybody asked you “Is that a Belstaff” I would be more than happy to reply ” No mate, a Frank Thomas”. Although the website says there are two colour options, I could only find black. Which is probably the one you’d want. Or maybe not, when you read my final review. And the options only seemed to go up to “L” …I’m a “XXL” at least! Options: As well as the International, they also offer the Roadmeister, a very similar jacket with subtle additional detailing – quilted shoulders and elbows and a stitched seam around the pocket to give a neater shape. And if Black is a bit too square from you, for an extra £15 Claymore offer the jacket in 7 colours to match… or contrast with your Lammie. (Sand, Brown, Chestnut, Olive, Navy, Red and Camoflage for you old scooter boys! Other extras such as body armour, extra pockets, half belts, linings and county flags can all be specced when ordering. My thoughts: This jacket is a different kettle of fish from the rest, a step up in quality (and a little in price too). 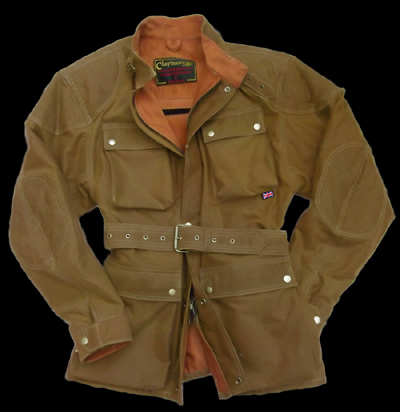 Claymore jackets are proudly individually handmade in Yorkshire, England (despite the Scottish sounding name! ), While all the other jackets are “off the shelf”, Claymores are Bespoke. All the jackets are produced to order, and can be customised to your particular requirements. This means you might have to wait a little while (6 weeks or so) before receiving your jacket. At the moment, they aren’t taking any more orders until the middle of October. If money was no object, I think this is the jacket I would choose, even over a Belstaff or Barbour, and I would add some custom touches to make it my own. If you haven’t quite got the budget for one of the big names, or you resent paying over the odds for a brand name, there are plenty of options out there. I hesitate to say “cheaper” as that implies lack of quality, and all the jackets I have reviewed seem to be of a decent standard. You’ll be able to find cheaper jackets out there, but I think you’llb e hard pushed to find good cheaper jackets. This entry was posted in Kit and tagged Barbour, Barbour International, Belstaff, Belstaff Trialmaster, Claymore, eBay, Frank Thomas, Pitman, Roadmeister, Speedwear, Trail Blazer, Trialmaster, Waxed jacket by crocodilejock. Bookmark the permalink. Thanks Ken, appreciate the additional information. Very thorough review my man! Keep up the good work.